When you import your data from Google Sheets or CSV files, date-time attributes are likely to be first recognized as numeric data or text data, and they will need to be converted to timestamps before being visualized and explored effectively in Keshif. Once your data is ready, you will get the best automated interactive visualizations ( a rich, zoomable, filterable line chart), and you can easily extract and explore month, day-of-week from your time attributes. Choose the format that matches your data. You can convert from "year", "Serial/Sheet Date" (such as from Google Sheets), or UNIX Timestamps. You can convert from various text formats, such as "12/30/2015" (Month/Day/Year), "12/30/15" (Month/Day/Year), or "2015-12-30" (Year-Month-Date). Custom text format: If your date field format is not among listed options in Keshif, you can parse it by specifying your own format using the "Custom" option. Keshif uses d3's time format : https://github.com/d3/d3-time-format. For example, to parse dates in format "12/30/2015", you would enter %m/%d/%Y. After these steps, your dashboard will be refreshed, and you will see your date-time data under " Timestamp" group in the attribute list panel on the left side. Keshif will receive these timestamp values as numeric attributes in spreadsheet date-time format. Click on the "Derive" icon, select "Convert to Timestamp", and choose "Serial/Sheet date". 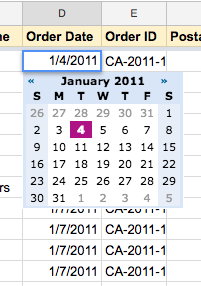 When date-time data is detected correctly in Google Sheet, it allows you to edit them with a calendar view. Although it does not affect how data is imported to Keshif, you can also format your date field within Google Sheet using Format -> Number -> More Formats -> More Data and Time Formats. Learn more at Google Support. Keshif's Boost feature can help you quickly identify potential date conversions. Suggest extraction of month/day-of-week/etc from an existing timestamp field. Suggest adding a time-stamp attribute to the dashboard on the wide bottom panel. Note: To auto-suggest conversions, Keshif looks at values in the year range (1950...2050). If your data falls outside this date range, please convert your fields manually using the derive menu for each attribute. Please contact support@keshif.me for any questions or support, and we'll be happy to return with more information specific to your case.